A quiet restaurant, empty but for a single rectangular table, littered with dishes of food and a half dozen empty containers: beer cans and bottles of wine (both red and rice), scotch (Johnnie Walker), and soju, a clear, cheap alcohol that comes in distinctive green bottles with twist-off caps. The camera sits at table-level, often exactly parallel to the table but sometimes angled slightly one way or the other. The drinkers sit on either side, conversing about life and relationships, very visibly drunk and eventually engaging in some kind of social faux pas: crying, screaming, accusations, and insults, desperate declarations of love, an impromptu striptease, or perhaps a nice nap. 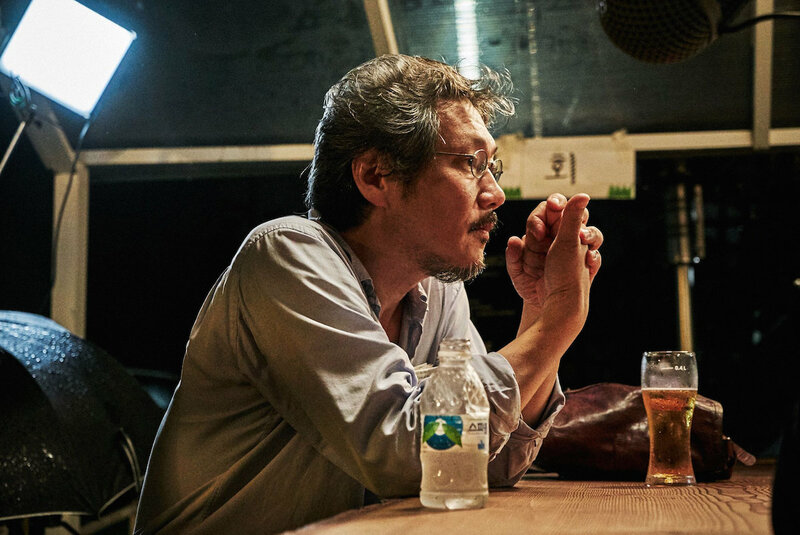 The table is the beating heart of Hong Sangsoo’s cinema, the irreducible center of his explorations of romance, infidelity, and self-deception. His films, endlessly inventive in narrative structure while sticking doggedly to the same basic plots and characters, always come back to these tables. Men and women drinking, eating, smoking, ripping themselves, and others, to shreds over the impossibilities of love, faith, honesty, or understanding in an illusory world where the lines between dreams and reality, past and present, right and wrong, are never entirely clear. Since his debut in 1996, Hong Sangsoo has been one of the most prolific and consistent directors in the world. With twenty-two completed features (a new one is set to premiere in a few weeks at the Berlin Film Festival) in twenty-two years, he’s worked at pace almost unheard of outside a studio system. With a steady audience on the international festival circuit and little in the way of mainstream theatrical success, his films are shot quickly and expenses are kept low: his cast of professional actors working for the fun and prestige that comes with his name alongside a crew supplemented by students from his day job as a film instructor at a university in Seoul. Claire’s Camera, which premiered at the 2017 Cannes Film Festival, was shot in nine days at the 2016 Cannes Film Festival, with the initial editing completed on the tenth day. Over his career Hong has become less and less detailed in his prepared screenplays, now going into a shoot simply with locations and a structure in mind. He writes the day’s dialogue early in the morning, gives the actors a few hours to learn their lines, and then shoots, a process adapted from Jean-Luc Godard. The French New Wave casts a heavy shadow over Hong’s work, his vacation settings, long conversations about love and philosophy, (self-)deceptive male heroes, and unshowy compositions inspire comparisons with Eric Rohmer, while his structural adventurousness seems indebted to Jacques Rivette and Alain Resnais. Hong himself claims inspiration from Robert Bresson, and his early films reflect the minimalist style of Taiwanese directors like Edward Yang and Tsai Ming-liang. But all that is grasping at comparison: Hong’s films are ultimately, uniquely his own. Though certain plot and character elements recur throughout his filmography, his career can roughly be divided in half, with each of those halves in turn split in two. In outlining and contrasting these different phases of his work, perhaps we can come to a better understanding of how someone can develop as a filmmaker while basically making the same kind of movie about the same kinds of things over and over again for more than twenty years. The first phase of Hong’s career covers his first three films, 1996’s The Day a Pig Fell Into the Well 1998’s The Power of Kangwon Province and 2000’s Virgin Stripped Bare By Her Bachelors. All three are multi-part narratives, the first being a network story about a group of people, most of whom are unaware of their connection. It’s divided into four parts, each initially written separately as an experiment by Hong’s students . Each section takes the perspective of one node in a love quadrangle: a drunk and belligerent writer; a germaphobe businessman; a young woman who is being stalked by a coworker while she is having an affair with the writer; and an older woman, the businessman’s wife, who is also sleeping with the writer. The film is bleak and deliberate, with sudden spasms of violence that blacken the absurdity of its humor. For his next film, and every subsequent one, Hong would be the sole screenwriter. Both Kangwon Province and Virgin Stripped Bare are split in half, with each section corresponding to the perspective of one of a couple who are involved in a love triangle. In Kangwon, a man and a woman each go on vacation to the same place, but never meet, though we eventually learn they were there at the same time. The first story is fleshed out by elements revealed in the second, which begins earlier and ends later. Virgin is similarly split, and again more elements are revealed in the second story which deepens our understanding of the characters and their relationship. Intriguingly, and unlike Kangwon, events don’t exactly lineup: similar scenes are played differently, not just in performance but in facts both minor (whether a fork or a spoon is dropped, who found a glove) and major (just how much in love are these characters?). In all three of these movies, neither the men nor the women are given the central place in the story, rather they are balanced between both sexes. That is not the case in the next phase of Hong’s career, which runs from 2002’s On the Occasion of Remembering the Turning Gate through 2009’s Like You Know It All. These films, which also include 2004’s Woman is the Future of Man, Tale of Cinema (2005), Woman on the Beach (2006), and Night and Day (2008), doggedly stick to the male perspective, and almost all revolve around a doubling of the woman he is in love with, mirrored by narrative cleavings much like those in the first three films. The movies are usually split in half, with the second repeating and varying the plot, characters and dialogue of the first half in significant ways, with dramatic, romantic and/or comic effects. Only Woman is the Future and Night and Day are not split in two, with the latter instead divided by the hero’s interactions with three different women, while the former sticks out in many ways: its love triangle involves two (distinct, not doubled) men and one woman, aside from a few flashbacks it is narratively straightforward, and it’s the most mean-spirited movie of Hong’s career. Turning Gate, though, is one of his best, and marks the first time when the narrative structure takes on a resonance outside itself, where it becomes more than just a stylistic quirk but rather an expression of the hero’s emotional state and understanding of the world, as he internalizes the mythic story of the eponymous gate and begins to reenact it in his own life. This conceit is twisted by Tale of Cinema, in which the first half turns out to be a short film we’re watching alongside the man the movie was based on and the movie’s lead actress. When the man, trying to recreate the on-screen version of his life, becomes fixated on the woman, she explains to him that he didn’t understand what the movie was about at all. Tale of Cinema also introduces what will become Hong’s most idiosyncratic visual technique, a brief, quick zoom in the middle of a long single-take scene. 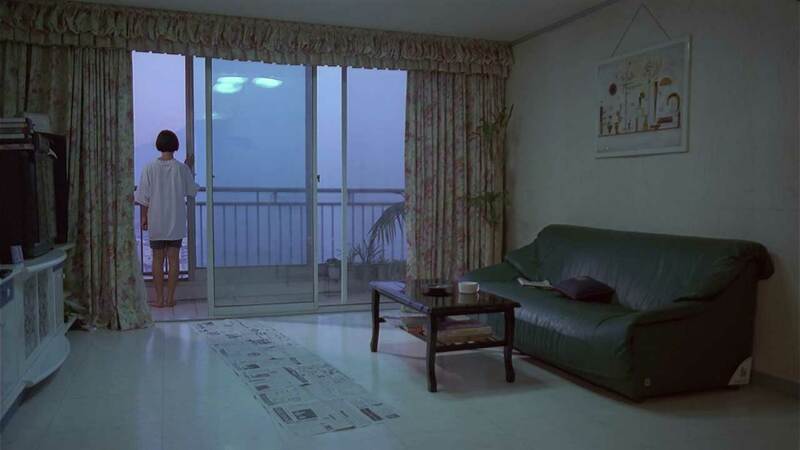 While never as rigid a minimalist as Tsai Ming-liang or Apichatpong Weerasethakul, Hong had mostly used the same basic aesthetic approach: long, unbroken scenes with a static camera set in medium to long distance. Wanting to liven up the shot, Hong would sometimes add brief pans and now, a quick, short zoom closer into a scene, which would break up the monotony of a shot and be used for comedic or dramatic effect without sacrificing the integrity of the single-take performance. In its first uses, the zooms have a charming amateur quality, and though later they become smoother, more professional, they never approach the stately alienation of the zooms used by Kubrick or Altman. Woman on the Beach takes for its hero a film director, who goes to the seaside in order to work on a screenplay. Along the way he seduces his friend’s girlfriend, who had tagged along on the trip. They part at the film’s midway point, on the way back to Seoul. But shortly thereafter the director returns to the beach, hoping to meet up with the woman but in the meantime hooking up with another vacationer, using many of the same lines he used in the first half of the movie, though the woman never quite lives up to her predecessor. When the original woman shows up, she sees through his increasingly labored attempts to cover-up his dalliance, ultimately wresting control of the film away from him, and driving off on her own. It’s a difficult film to love, grounded as it is for most of its running time by its generally despicable protagonist, but it points the way toward the second half of Hong’s career. Like You Know It All marks a transitional phase between the first and second half of Hong’s career (it’s also the first one I saw, which may be why it feels so pivotal to me). A two-part story about a director who first goes to a film festival to serve on a jury and then to a small town to screen one of his films at a college, it’s the funniest of his films to that point. The repetitions between halves become increasingly odd and inconsequential (in both parts someone is late picking him up because they had to buy bread), and the director, while certainly self-obsessed, is less cruel or pathetic than put-upon and bewildered by the bizarre behavior of those he meets (some of which is tonally quite jarring, misjudged intrusions of horror in an otherwise bright comedy). There is even a lovely, lyrical passage where he runs away to a beach, the simple beauty of which is a rarity in the early films outside of a couple moments in Turning Gate and Kangwon Province, though passages like this will become more common through the 2010s. Like You Know It All also marks the first appearance in Hong’s work of the two actors who would be most vital to the next phase of his career, Jung Yoomi and Yoo Junsang. The same year as Like You Know It All, Hong directed a short film as part of the omnibus project Visitors called “Lost in the Mountains”. It stars Jung Yoomi as a woman narrating the story of her encounter in a small town with a fellow student (Lee Seongyun) and a professor she had had an affair with (Moon Sungkuen). Its follow-up, Oki’s Movie (2010), uses the same actors to explore basically the same scenario: woman film student begins a relationship with a fellow student after ending a secret affair with their professor. The twist was Hong’s most ambitious narrative experiment yet: the story is told three different ways, in three short films which roughly correspond to the perspectives of the three principals in the love triangle. The shorts are preceded by a possibly unrelated story about a director/professor who learns a secret about a fellow professor he admires and then is harangued at a Q&A about an affair he’d had sometime before with one of his students. Oki’s Movie is a puzzle film, but the pieces don’t exactly lineup into a neat chronology: differences of perspective, as well as time and place and the conflation of dream, reality, flashback and cinema all into the same visual and narrative style make parsing the exact sequence of events impossible. This kind of kaleidoscopic structure Hong would continue to explore throughout the period: Hahaha (2010) has a frame story where two men recount their recent trips to a resort town, never realizing that not only were they there at the same time, but that their stories are about the exact same people; The Day He Arrives (2011) is about a man (Yoo Junsang) who appears to be caught in a Groundhog Day like time warp, meeting the same people in the same places again and again, most of whom seem unaware of the repetition, though he might be; In Another Country (2012) relates a young woman’s three drafts of a screenplay, all about a French woman (Isabelle Huppert) as she becomes involved in various infidelities in a beach town; Nobody’s Daughter Haewon (2013) is composed of three separate journal entries, describing a young woman’s dreams and real-life encounters in such similar terms that we can never be sure where the dividing line is between them; Hill of Freedom (2014) is told via a series of letters written by a Japanese man to the Korean woman he loves, we see the story play out as she reads them, except not only does she mix-up the letters and so read them out of order, but she actually loses one which may or may not contain key narrative information. The one film in this period not to feature an outlandish structuring device is 2013’s Our Sunhi, in which Jung Yoomi plays a film student who is pursued by three men, all of whom describe her in exactly the same utterly generic abstract terms. She has to navigate their affections, some of which are reciprocated, and get a recommendation to a college abroad, so she can leave them all behind. Our Sunhi is the culmination of the Jung Yoomi films, in all of which she plays a very similar character. I like to think of them all as extensions of Oki’s Movie, with Jung as Oki constantly trying to sort out how to deal with the men in her life by making movies about them. That is the premise of her short in Oki’s Movie: she wanted to learn about a relationship so she made a movie about it. She says she chose the actors (the same actors who play in the other three parts of the film) because of their resemblance to the real people, but the limitations of the resemblance means the experiment can’t quite work. Her conclusion, for me the key statement about Hong’s work, is that “Things repeat themselves with differences I can’t understand.” I can imagine Oki making “Lost in the Mountains”, a more traditional take on her experience, then moving on to write the stories of In Another Country, casting herself in a new role and letting a pro like Huppert take the lead. Finally, she makes Our Sunhi, where her ultimate conclusion is that while these boys may be sweet, may be pretty, and may hold the key to her getting into the college she wants, her best solution is to just run away as fast as she can. The most recent phase of Hong Sangsoo’s career begins with 2015’s Right Now, Wrong Then and runs through the present, with 2016’s Yourself and Yours and his trio of 2017 films: On the Beach at Night Alone, The Day After and Claire’s Camera. Four of the five star Kim Minhee, all but Yourself & Yours. Hong and Kim began an affair during the making of Right Now, Wrong Then, which has caused a scandal in Korea, led to Hong’s filing for divorce, and has inspired biographical readings of their 2017 films, all of which revolve around the messy aftermaths of affairs. But Hong has been warning against using his personal life as a key to reading his films for years, both in interviews and Q&As and in the films themselves. The danger of biography to art is the fundamental subject of Oki’s Movie, for example, and Kim even makes a joke about it in On the Beach (“Personal stories are boring.”) Rather than mere dramatizations of events from his life, what these later films have in common is a newfound hopefulness and belief, the biting cynicism of the early films, their desperation and irresolvable desires haven’t exactly gone away, indeed the men in The Day After, Claire’s Camera and the first half of Right Now rank with the worst Hong has yet created. But instead of falling victim to these men, or imagining hypothetical means of escaping them, the women in these later films achieve the impossible: a balanced and equal romance (in Yourself & Yours and the second half of Right Now) and a kind of philosophical peace (in The Day After). In this regard, On the Beach and especially Claire’s Camera are outliers. The former featuring the formidable Kim’s best performance, alternately sweet and lonely and fiercely outraged, going into a drunken rant at a table about all those who are unqualified to love. She finds a kind of peace in the end, perhaps, with Haewon’s dream strategy, but not before she is dragged from her European idyll by a mysterious Korean man who proceeds to maniacally wash her windows. In Claire’s Camera, Kim is fired for reasons she can’t understand and her boss refuses to tell her (the boss believes she slept with a director who the boss has been seeing). At a party, the director mercilessly berates her for her unladylike behavior (she’s wearing jean shorts and make-up). And yet, when she meets Claire (Isabelle Huppert) a French school teacher, the two form an instant rapport and spend a happy day together speaking in broken English, a utopian vision of a transnational world if ever there was. Right Now, Wrong Then, where in the first half (“Wrong Then, Right Now”) everything goes wrong because the director (Jung Jaeyoung) and the woman he meets (Kim) fail to be honest with each other (he alternately arrogant and falsely faltering while concealing the fact that he’s married and she overplaying an image of demure femininity), the second half offers hope: both characters are a little more open, a little more trusting. Hong’s compositions match the balance of the relationship, and while the two don’t share anything more than a kiss goodnight, a real human connection has been made. The struggle to break through abstraction is ultimately what Hong Sangsoo’s cinema has been about, from the “digging deep” of Our Sunhi to the rejection of the words we use to describe reality as illusory in The Day After, in favor of actual, truthful experience. It can be found in the feeling of flowers, a habit of Hong protagonists from the very beginning of his first film through Kim Minhee’s return to the Korean earth in On the Beach, or the sensations of weather, the rain in Turning Gate, the bitter cold and providential snowfalls of Oki’s Movie, The Day He Arrives, Right Now, Wrong Then and The Day After, the warm sunshine of Claire’s Camera, Night and Day, Kangwon Province, and In Another Country. In Hong’s films emotional wounds take physical form in scratches and scars and (in Yourself and Yours) a mysteriously broken foot, while inanimate objects take on deep resonances, a red baseball cap, a pair of gloves, umbrellas, and goldfish that jump through time and space, letters and journals and sketches which create and contain entire worlds. The drinking table, with its clutter of objects and people, nourishing food, mind-altering drink and unfathomable human relationships, is the world in miniature. In a reality that doesn’t cohere, governed by irrational rules in conflict with basic human nature, where people too often fail to meet their ideas of themselves and other people, and are either blithely ignorant of that fact or deeply troubled by it, where there’s no clear delineation between what is real and what is not and time is cyclical, where infinite worlds are possible and there are no straight lines, how can we function?